Most common troubles of advanced violin players? What are the most common corrections an advanced player would hear from a teacher? + starting again after 2 year break and best advanced pieces for violin. I'm an amateur when it comes to knowing about music theory and violin playing, but I'm writing a story where my main character is a violin player. Not wanting to sound completely ignorant, I would like to ask for some help. I'm not going into details about it, but I can't completely avoid this matter either. So imagine a girl, 18 years old, talented, but she put playing aside for two years to focus on school. 1. What would cause her troubles when starting again? Clumsy fingers? Holding bow correctly? And how much time do you think she'd need to get back in form? 3. Some beautiful violin pieces/concertos for someone who is on a level of a 1. or 2. year student in music academy? Most likely pieces they'd learn? @ Writer: Very interesting topic. First off, your English is just fine, I'd never known it not to be your native language. There are a couple question's I have. 1. How long had she been playing before she stopped for school. 2. What was her caliber of playing (proficiency). In my opinion, if she was very proficient before taking the break then she should have very little problem regaining her skills. If she had only played for a year or two prior, then more than likely she will face the problem's all / most student's have, which include posture and bow hold. Finger speed come's with many hours of practice. She must dedicate all her free time to practice. How good does she want to be? I think, Fiddlerman / Pierre is more qualified to answer your questions. I'm learning too, but these are my thought's. How long she had played before and what caliber she was at is an important part of what she will face going forward. hey, thanks for taking time. Then did she succeed in her studies for which she quit violin? What did she study and why did she prefer it over violin? Presumably she didn't do well or found out she didn't like it much. Nope, she studied art but due to certain circumstances failed to enrol in Art Academy. Right after that, she gets a one-in-a-lifetime opportunity to pursue music, and she did so. (This switch from her expected future, the failure, and rediscovering music is a part of the main plot twist) For some time passion for art dominated passion for music, but they change places again. Well, clumsy fingers would definitely be something that would plague someone who hasn't practiced in a year or so. If I don't practice for more than 3 days I get that. After being back in the groove for awhile, then basically anything that she would think to be wrong would be troubling her. It would most likely be something that has given her issues for a very long time. For instance, I am not very good at high E string notes, and never have been, so I have to dedicate extra time to practicing them. For most people though after a few years of playing you get to the point where you can recognize most problems with your playing and know how to fix them on the fly. Personally I am not good at hearing E string, so I know that I have to memorize the finger positioning on my instrument. That's all I can really think of xD None of those are solo things, except maybe Paganini, but they all have amazing violin sections. Or Pachabel Canon in D? I would like to think that someone who was passionate, dedicated, and disciplined, playing from the age of 5 to 18 would be interested in and perhaps ready for Bach's sonatas and partitas for solo violin. Btw, can anyone estimate the difficulty of Vivaldi's four seasons? I've been getting so many different opinions on this matter I'm quite confused right now. I know it's sort of subjective, but can it be a 'student concerto' and a 'piece for virtuosos' at the same time? Same thing about Beethoven's violin concerto. Btw, can anyone estimate the difficulty of Vivaldi's four seasons? Look for people playing it on youtube. If you see no one as young as your character, you might suppose that it would be a challenge for her. If you see a half-dozen ten-year-olds playing it, then not such a challenge. I think you have to know... is she one of the many thousands of talented young players who have played since they wore diapers or is she one of those few who, at a young age, became passionate. There are many players who started at a young age, played through High school, and never again. There are some who played at a young age, became enraptured with the instrument and devoted the rest of their lives to it. Who is your character? A person who plays the violin or a violinist lusting to rekindle her passion? Who is your character? A person who plays the violin or a violinist lusting to rekindle her passion? She is definitely someone who is not only prepared to give up social life for hours of intense practice to devote her life to music as a professional, but someone who has rediscovered her former passion and consolation in it, after her life falls apart. It's the emotional journey I want to write about, try to find words for what music can mean to someone. Well, it sounds like she is passionate for a job or a career more than being passionate for art itself or violin itself or music itself. I mean you will need some explanations for her passion changing twice. Does it depend mainly on her opportunities? I mean you will need some explanations for her passion changing twice. Does it depend mainly on her opportunities? It's nothing strange with having more than just one interest in your life. Music was a huge part of it but she also wanted to get involved in art and was soon hooked by it. It happens a lot that people - especially teenagers - want to try different things when it comes to deciding about their future. But she went beck to violin before she knew the Art Academy isn't going to happen for her - because she missed it and regret leaving it aside. The fact that she gets the opportunity soon after that is just a coincidence. I hope that clears your doubts about her true feelings for violin - though I can't imagine someone would give up their whole life to dedicate it to something they have no passion for. If the career was the case, she'd just do business or law or something people usually do for money. Also, I don't know why would I write about musician who doesn't care about music. I gave up piano, my Chinese Erhu, Guzheng for school but eventually I found my way to playing again, those instruments were inaccessible for me. I never go back to the same level but I was never good to start with. I have a nephew who plays piano at professional level and quit. However, because he loves piano, he still plays as a hobby whenever he has the opportunity to play (never two whole years without playing). What I want to say is: If she is passionate about violin, she will never give it up for two whole years! Unless violin is made inaccessible to her. If she is willing to give it up for two whole years, she is not passionate enough about it. If she gave it up for something else, like you said, studying, studying for what? Why only for two years? She went to two-year college? If she was going to school for better career opportunity, then she would not come back to violin as a professional violinist. Other things/goals will take the time from her and hinder her from practicing eight hours or more a day to be a professional violinist. If she gave it up for something else, like you said, studying, studying for what? Why only for two years? If she was going to school for better career opportunity, then she would not come back to violin as a professional violinist. 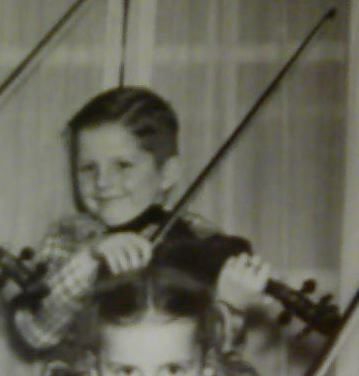 She had a 4 year study, she only gave up violin for the last two years which were more demanding and crucial for further education (entry to the Academy). Art requires a lot of practice, just as violin, and she couldn't do both at the same time to do it properly. She had to choose, and she chose school (every rational human being would). Future is more than just what you like at the moment. Sometimes you can't do what you like the most in order to survive. Unless you get the chance. She got the chance. Now let's leave the story behind it aside, it is irrelevant to my question. There's going to be quite a precise explanation on 500pgs and if it's ever published, you are welcome to investigate. And my personal experience show that quitting for a certain time in order to give place to something else, doesn't mean you aren't passionate enough. It's very subjective. Didn't take the time to read all the replies but this person can theoretically be back in the saddle within weeks. I've known professionals who stopped playing for years and were working again afterwards. It will be awkward at first but it will come back. Make sure that person (I'm assuming it's you) starts off with slow meticulous scales and etudes (exercises) and doesn't rush the warm ups too much. Also, not too many hours in a row. Better to break it up into short effective sessions than painful rehab playing.